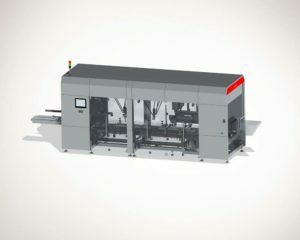 Fully automated Case Packer, firmly focused towards the Human. iXAPACK PACKAGING (iXAPACK GLOBAL brand) has designed a brand new Case Packer, fully automated: The iCP Case Packer. Beyond its standards functions, which are to shape, fill and close the cases, the new generation of CasePacker has been developed following a detailed survey over our customers in order to identify and take into account the line operators needs and the production and maintenance departments’ requests, and above all to improve the productivity monitoring. • Real-time feedback for the production monitoring. Tomorrow, the iCP Case Packer will be fully connected and will offer the opportunity to the maintenance department to order parts, directly to our departments, thanks to the machine screen. iXAPACK PACKAGING aims to provide more and more flexibility, ease of use and productivity to its customers taking into account the welfare of people who daily work on its machines.